Click to view, print & share. Click to view, print & share (2 pages). Click for PRINT & SHARE flyer. For more information, please ask a staff member. Enjoy a 45-minute guided hike. Please bring a hat, water and walking shoes. No reservation required, unless you are a group of 5 or more. Ages5 and under. Have you ever smelled skunk spray? Well now is your chance! Join us as we read 'The Skunk at Hemlock Circle' by Victoria Sherrow, and then learn a little about skuks here in Florida! Registration required, please call 321-264-5185. Ages 6 to 12. Discover the impacts of mining operations through the exploration of some tasty treats! Learn about mining here in Florida and what minerals many of our householld items are made from. Registration required, please call 321-264-5185. Join yoga instructors from Inverted Elephant for a traditional class for all levels on the porch! Wear loose-fitting clothing and do not eat anything an hour before class. Bring water and a mat. Registration required, please call 321-264-5185. 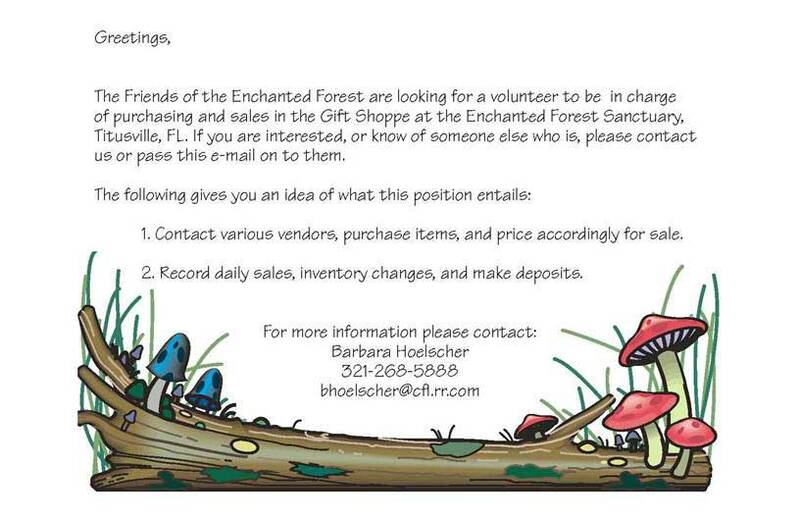 The Enchanted Forest Sanctuary is looking for dynamic individuals with a passion for the environment! Come learn about our various volunteer opportunities. Registration required, please call 321-264-5185. Join local naturalist Frank Robb and learn about our local alligators and the issues thay face, as well as an in-depth comparative analysis of crocodilians world-wide! No registration required. Free family-friendly hands-on activities in the screen porch, ongoing in the afternoon! No registration required. Ages 5 and under. Come read the short story How Gimble Gopher Tortoise Found a New Home by Kay Thorpe Bannon, and get hands on with a real tortoise shell. Then see how we take care of our two resident gopher tortoises Ashton and Two-Bits! Registration required, please call 321- 264-5185. Ages 6 to 12. 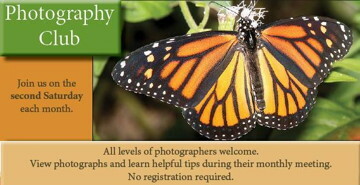 Come out for a beginning birding class here at the sanctuary. 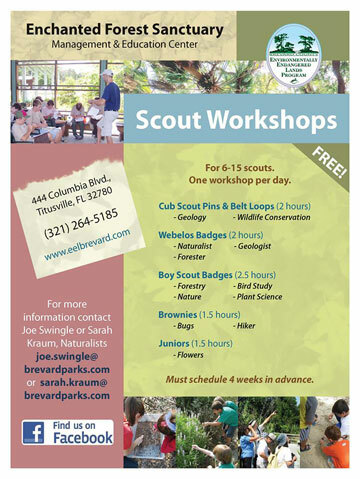 Learn about birds here in Florida and practice your skills with binoculars and spotting scopes! Registration required, please call 321 264-5185. Join yoga instructors from Inverted Elephant for a traditional class for all levels on the porch! Wear loose-fitting 0clothing and do not eat anything an hour before class. Bring water and a mat. Registration required, please call 321-264-5185. 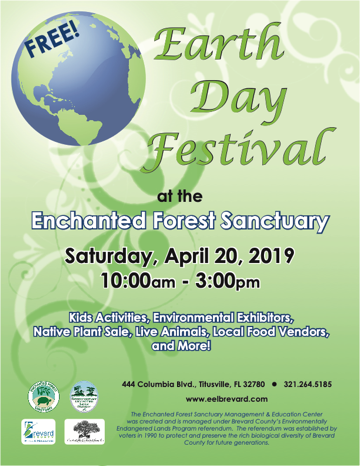 During this free event, guests are invited to enjoy guided hikes, special presentations, meet bats and other Florida wildlife, explore environmental exhibitors, listen to live music, and much more! Earth Day Festival will feature many children's activities, including face painting, crafts, and hands-on activities! No registration required. JOIN THE FRIENDS OF THE ENCHANTED FOREST A non-profit volunteer organization committed to assist the EEL Program with conservation of The Enchanted Forest Sanctuary, and educate visitors about the unique geology and biodiversity at the sanctuary. 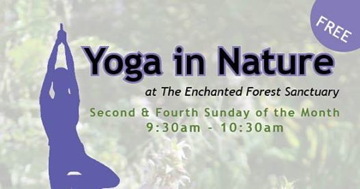 LOCATION Enchanted Forest Sanctuary 444 Columbia Blvd, Titusville, FL. In south Titusville on SR 405 across the street from the Space Coast Executive Airport. ENCHANTED FOREST HOURS: Tuesday through Sunday. Closed Mondays. 9:00am to 5:00 pm. - No pets, bikes or smoking in the Sanctuary. All activities (unless otherwise noted) will take place in the Enchanted Forest. The Enchanted Forest Nature Sanctuary is located south of Titusville, FL on Route 405, 1/2 mile west of U.S. Route 1. Calling All Volunteers & Guides! Hike desk, exhibit area and trail hosts are needed. Responsibilities include: greeting visitors at the center and on the trails; providing general information, guidance and trail maps; assisting visitors with hands on educational exhibits. Hosts are primarily needed on Saturdays and Sundays. Sharon Bohlmann and JoAnn Trainer would like to invite you to join the Volunteers in the beautiful Shoppe in the Forest. It is a fine place to spend some time and help some people find a trinket for themselves or a gift for a loved one. It's a good opportunity to leam more about our Sanctuary, and to encourage our Visitors also. Great conversations take place in and around the Shoppe and Science Hall. Visitors gather and chat, hover and discover! So come, join the little Shoppe in the Forest! Click here for more information. For the past 10 years the Shoppe in the Enchanted Forest has provided visitors with reminders of their visit. Proceeds from sales go toward educational programs in the forest provided by both staff and volunteers. The Shoppe carries educational games for children of all ages, books for nature lovers, gifts for that special someone, t-shirts that spell out your love of the forest and unusual treasures for travelers passing through. The present shopkeeper is now 10 years older than when she took on this venture and needs help. Putting price stickers on merchandise when it arrives in the forest and placing it on the shelves is all that's needed and a great way to help support your sanctuary. Call us and we'll be glad to talk with you. This is YOUR forest, let's always keep it enchanted. Volunteers can join Gardeners to care for the Forest's butterfly gardens for upkeep and to "deadhead" (remove dead flower heads from a plant) blooms so more energy goes to the next flowers. The spent blooms are collected for next year's seeding. If interested, please contact Lois Harris at lois6459@att.net for the next workday. Thanks for all your hard work...the gardens show how much you care! Guide or be guided: Regularly scheduled HIKES on Saturday momings at 10:00. Call Patty at 264-5185 to (1) make a guided hike or cart tour reservation, and (2) give a hike (3) Guide one of the many groups visiting the forest! Are available for all folks who have difficulty walking distances. That means visitors and our own Enchanted Forest friends and volunteers. Call 264-5185 for further information. PLEASE JOIN US! WE NEED ALL OF YOU VERY MUCH!